The National Commission for Civic Education (NCCE) has observed that there is no evidence of internal democracy in the two major political parties in the country. 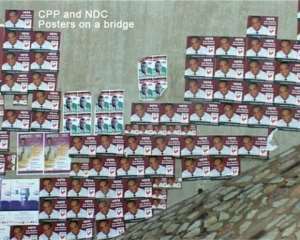 Speaking to the paper in Accra recently, the chairman of the NCCE, Mr Larry Bimi said the observation of Election 2004 revealed that some of the primaries of the parties, the New Patriotic Party (NPP) and the National Democratic Congress (NDC), were fraught with undemocratic procedures. Mr Bimi appealed to President Kufuor to effect that change which would be “the best legacy he will bequeath this beautiful nations of ours.” The chairman of the NCCE said his organisation would focus part of its civic education activities this year on educating politicians on the principles of democracy, adding that that was because it was politicians who gave out the monies and other materials used in influencing the electorate. The NCCE is to build a house dedicated to democracy in the country to serve as the centre for the promotion of democracy in the West African sub-region. The head of the research unit of the NCCE, Mrs Zakaria Ali, explained that the NCCE's observation before and after the elections was aimed at gathering information to influence and evaluate its programmes in line with existing legislation.